Indiana author Kayleen Reusser announces that a second book in her World War II legacies series currently is being published and will be released to the public in September. 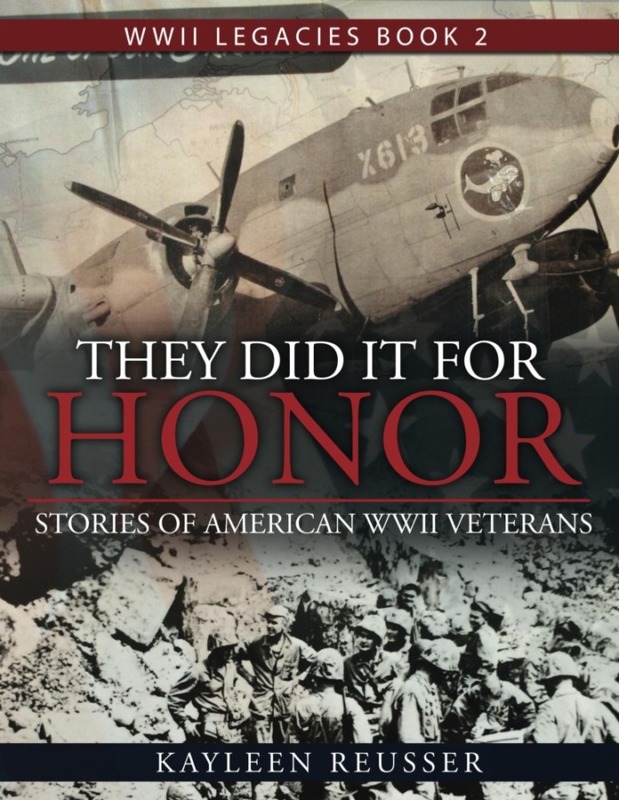 They Did It for Honor: Stories of American WWII Veterans is a compilation of stories from 34 World War II veterans representing all branches of the military. In addition to war vignettes written by Reusser based on hundreds of interviews, the book includes photographs taken by the veterans during World War II, providing a historical account through the eyes of those who served. They Did it for Honor will be available for purchase as of September through Amazon.com and through the author’s website, www.KayleenReusser.com. A book signing party has been planned for Saturday, November 4, at the downtown branch of the Allen County Public Library, 900 Library Plaza, to tie in with the Veteran’s Day holiday. The party, scheduled for 1 p.m. to 3 p.m., will allow the featured military members who attend to interact with fellow veterans as well as meet the public, who is encouraged to attend and thank the veterans for their service. In addition, the veterans have agreed to sign their respective sections of the book, providing a unique keepsake that can be treasured for generations to come. “The book gives a personal feel to an important time in world history,” said Reusser. “The party will be a rare opportunity to meet these historical figures who helped change history.” Her previous book, World War II Legacies: Stories of Northeast Indiana Veterans, was published in 2014. Reusser is married to a retired U.S. Air Force airman and the mother of an airman. “I wrote the books to show my support for those who have served and currently defend our country,” she said. Since 2015, she has written a biweekly column for The News-Sentinel in Fort Wayne that includes stories of World War II veterans. To record the veterans’ stories, Reusser has conducted 200 interviews over the past five years of veterans from all branches of the military who served during World War II. Represented in the book are nearly three dozen former members of the U.S. Army, Army Air Corps, Navy, Marines, Coast Guard and Merchant Marines, all of them more than 90 years old (two were 100 years old during their interviews with Reusser). Of the 34 individuals whose stories were selected for They Did it for Honor, three have passed away since they were interviewed: Polly Lipscomb, a 101-year-old female Army officer who served as a nurse in England; well-known Fort Wayne media personality Bob Chase, who served as a cryptographer in the Navy; and John Wrestler of Montpelier, who served aboard a submarine. Most veterans featured in the book reside in Indiana, but the story of a Pearl Harbor survivor now residing in Hawaii also is included. The book features the stories of five women and 29 men representing 10 counties of Indiana. Veterans’ accounts from many major World War II battles are included, such as the Battle of the Bulge, D-Day and Iwo Jima, along with one from a veteran who witnessed the Japanese surrender at the end of the war. Reusser says she wrote the book for the non-military reader. “It is easy to understand the veterans’ stories with the added feature of including a large number of never-before-published photographs taken during the war,” she said. Among the rare photos are historical aerial scenes that Huntington photographer Bill Jones took of the cities of Hiroshima and Nagasaki in Japan just months after they were bombed by Allied troops. Several of Jones’ photos are on file at the Smithsonian Institute. Since Reusser began working with veterans to record their stories, she says she has become engrossed in all things relating to World War II. She and her husband recently completed a 10-day World War II tour through Europe that visited many historical sites including Omaha Beach and Dachau. In addition, she has twice served as a guardian for 95-year-old veterans with the Honor Flight of Northeast Indiana to Washington, D.C.